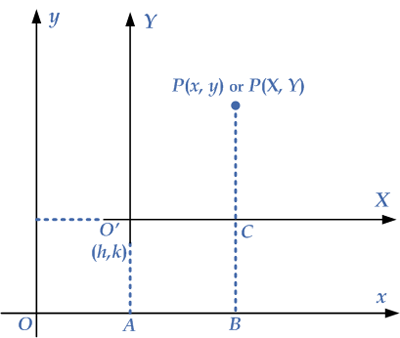 If in the plane with the given and axes new coordinate axes are chosen parallel to the given ones, we say that there has been a translation of axes in the plane. Let be any point in the -plane. Let - plane. We draw two perpendicular axes through -axis is parallel to the -axis and the -axis parallel to the -axis, as shown in the given diagram. In fact, -plane. The point has the coordinates with respect to the -plane. The equations , are called transformation equations and are used to find the coordinates of a point with respect to the new coordinate system, the -system. Thus, the point with respect to the XY-plane is . Conversely, if the coordinates of a point with respect to the -system are given, then the coordinates with respect to the original system can be determined by the equations , . Example 2: Let be a point referring to the -coordinate system translated thorough referring to the original coordinate system, the -system.